Using professional waxing products with the right sanitary supplies can make a distinct difference in the experience your salon provides. Practicing proper hygiene is among one of if not the most fundamental practice to the spa industry, and clients will quickly notice if your salon is less than impeccable. Keep your salon squeaky clean with our complete line of professional disposable waxing supplies, which includes everything from wax cleaners and epilating rolls to table paper rolls, wax collars and more. Sanitary supplies for waxing hair help you maintain a clean waxing table and help clients feel at ease as they are more likely to trust a clean salon over a messy one. Our disposable day spa waxing products also help your estheticians clean up in between appointments for a seamless transition from client to client. Shop now from our wide selection of professional waxing hair removal cleaning supplies to find everything you need to maintain your spotless salon. Empty wax tin with plastic lid. This fits most standard sized heaters and is a Cirepil product. Fits 14 oz. wax tins for easier removal of cans when switching waxes. Use to cleanse and gently exfoliate the skin before facial services. Disposable collars for wax wells. Wax collars 50 pcs. 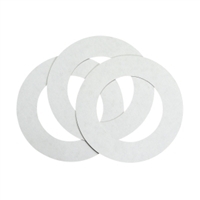 Fits 400 g (14 oz) Tins Paper roll to provide sanitary surface for waxing and other services. 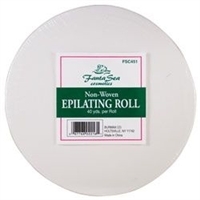 A 3 ¼" x 100 yard, non-woven epilating roll for use with soft waxes. Has a great reputation amongst estheticians! Ideal to clean wax spots on floors, metal, vinyl, melamine, bed covers, towels, and waxing accessories.